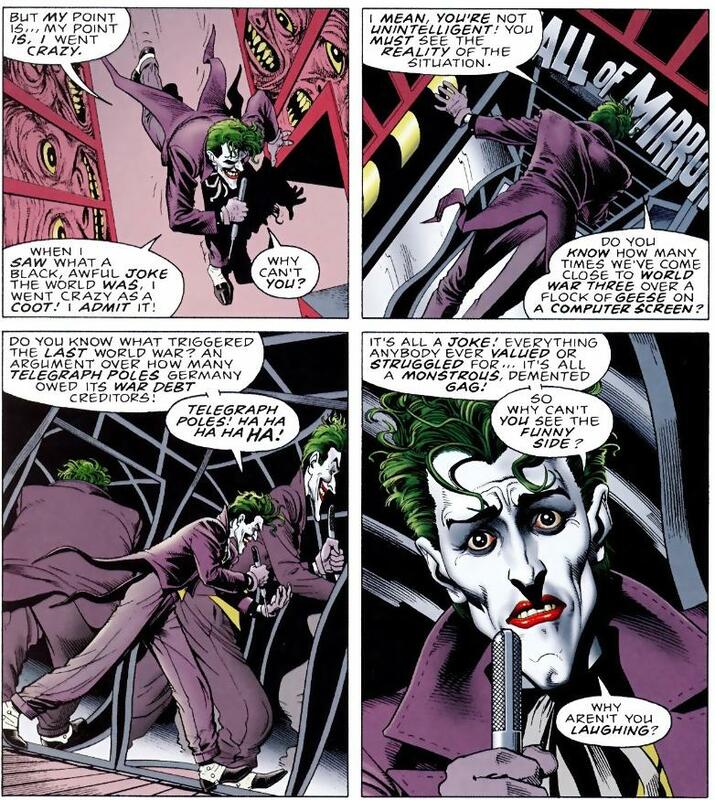 Is what the Joker says in The Killing Joke true? Do you know how many times we've come close to world war three over a flock of geese on a computer screen? Do you know what triggered the last world war? An argument over how many telegraph poles Germany owed its war debt creditors! Telegraph poles! Ha ha ha ha HA! More "grain of truth" than "true." This question on the "Skeptics" site goes into some detail about the telephone poles. Not a cause of WWII, but more of an incident in the problems that built up to WWII. France kept insisting that Germany pay the reparations after WWI, but the German economy was pretty shot and wasn't capable of it. Not helped by the Germans being at least partially obstructionist about the payments and the deliveries. The French were pretty much looking for an excuse (after years of feet dragging from the Germans.) The telephone pole thing was the incident chosen to set off the French take over of the German Ruhr region. It could have been anything. The telephone poles were just an example of a short fall in deliveries that could be taken advantage of. There isn't a confirmed incident over a flock of geese, but it has been used as an expression meaning basically that some stupid mistake or breakdown in the early warning systems could lead to all out war. In fact, there was a very close incident that only didn't result in war because one soviet officer had the balls to hold off on a retaliatory attack because he was convinced the radar system was mistaken. So, neither part of what the joker said was strictly true - but there's enough truth in both of them be concerning. Not the answer you're looking for? Browse other questions tagged dc comics the-killing-joke or ask your own question. Does the Joker care about Harley Quinn? What's the melody of Joker's song in The Killing Joke? What chemicals did The Joker fall into? Who were those Russians that the Joker was dancing with in The Killing Joke? Who is responsible for the scene involving Bruce and Barbara in 2016 “The Killing Joke”?